This assay system utilizes HEK293t cells that express NF-kB (nuclear factor kappa-light-chain enhancer of activated B Cells), and contain the luciferase reporter gene functionally linked to upstream NF-kB genetic response elements. Thus, quantifying changes in luciferase expression provides a sensitive surrogate measure of changes in the level of NF-kB activation. NF-kB is a signal transduction dependent transcription factor. 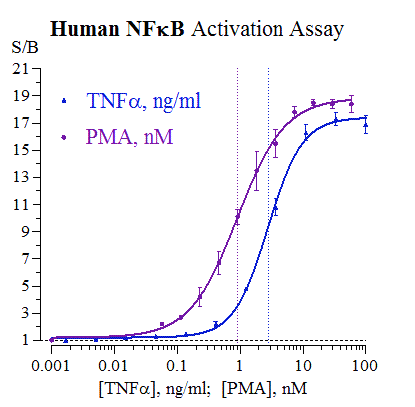 This NF-kB reporter cell line is validated to provide a robust dose-dependent activation response when treated with TNFa, or the Protein Kinase C activator Phorbol 12-myristate 13-acetate (PMA). As such, the principle application of this assay system is in the screening of test samples to quantify any functional activities that they may exert to modulate, either induce or suppress, NF-kB activities. INDIGO’s Human NF-kB Assay kit is an all-inclusive, single use assay system. In addition to NF-kB Reporter Cells, kits provide optimized media for use during cell culture and in diluting user’s test samples, a positive control activator, Luciferase Detection Reagent, and a cell culture-ready assay plate. Reporter Cells are single use reagents. They can not be refrozen or maintained in extended culture. The primary application of INDIGO’s cell-based nuclear receptor assays are to quantitatively assess the bioactivity of a test compound as an agonist (activator) or antagonist (inhibition of an agonist response) of a given receptor. Service assays include a positive control reference compound and ‘vehicle’ control for every experiment. A formal study report and all data files are provided to the client upon completion of the study. To receive a quote for your proposed study, complete & submit the online Request a Quote form or contact an INDIGO Customer Service Representative to discuss your desired study parameters. To initiate a Service Study, download and complete all fields of the Excel worksheet “Service Work Order" then submit the electronic file to INDIGO Customer Service.